Glasgow is Scotland's second largest city. It is a city of culture, style and is renowned for its friendly locals. We have a number of spa breaks in the Glasgow area. These include the 4 star rated Q Hotel Westerwood and Gleddoch House. Both these hotels are away from the hustle and bustle of Glasgow City Centre but still close enough if you want to venture further on your spa break deal in Glasgow. 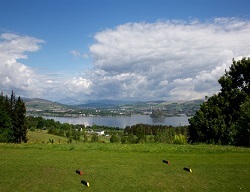 Each of these boasts stunning surrounding locations overlooking Scotland's vast countryside. For a bit of extra luxury why not enjoy one of our spa breaks in Scotland a the 5 star Mar Hall Hotel. If you have a special occasion to celebrate this is the perfect spa hotel near Glasgow to indulge in some rest and relaxation. Set in a tranquil 240 acre woodland estate just 10 minutes from Glasgow International Airport, this luxury hotel in Scotland also has a Championship golf course. If you are staying for longer and wish to see some of Glagow's tourist attractions then there is an abundance of things to do. Glasgow has brilliant shopping, nightlife, museums, galleries, parks, many of them which are free to visit. If you fancy taking in a bit of history then why not visit the medieval Glasgow Cathedral. Glasgow Cathedral is the only one on the Scottish mainland to survive the Reformation of 1560 intact. One and two night spa breaks packages are available at most of these venues in Glasgow but if you cannot find what you are looking for then please call us on 0800 246 5511 as we have other hotels that may be able to offer just a leisure break in Scotland.